Google is attempting to shed refracted light on its role in Prism today by asking the Foreign Intelligence Surveillance Court to allow it to describe the information it is forced to give the U.S. government. "We have long pushed for transparency so users can better understand the extent to which governments request their data," said the search engine giant in a statement posted to Google+. Google routinely publishes this criminal request data sought by governments worldwide. It was therefore the first of nine companies to release numbers for the recently exposed National Security Letters that demand companies turn over records in matters of national security. Facebook, Microsoft and Apple followed suit in an attempt to reassure users of their privacy, although all of this data is lumped together with criminal requests state, local and federal criminal requests. Google's petition is intended to further break these numbers down, as is declared that "more transparency is needed." "Today we have petitioned the Foreign Intelligence Surveillance Court to allow us to publish aggregate numbers of national security requests, including FISA disclosures, separately." "Lumping national security requests together with criminal requests - as some companies have been permitted to do - would be a backward step for our users." While Google's records may show that it was forced to give the U.S. government data only in court-ordered situations, that may not ease all users' privacy fears. That's because the 11 federal judges that make up the FISA court approved 1,789 government requests it received in 2012, according to The Washington Post. Just one - a single withdrawn request - was not approved. While privacy advocates call this a rubber stamp, the controversial Prism surveillance program does have its supports, especially after today. 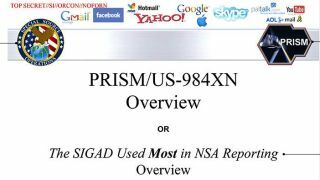 There have been more than 50 attacks foiled by the U.S. government with the help of Prism, according to testimony by National Security Agency director General Keith Alexander. With Google asserting its First Amendment right to the freedom of speech, we may learn more about Prism, or at least what information the government.